The current bid stands at £350, any further bid must be higher in order to qualify. Unless the winner can collect the print in person there will be a tracked postal cost of £10 on top of the winning bid. Beginning Tuesday (26th July until Midnight Saturday 6th August), we are hosting an online single item art auction to help raise funds for Hen Harrier Day. The item consists of a prestigious colour print kindly donated and signed by Scottish Wildlife Artist Martin Ridley in aid of our Forest of Bowland Hen Harrier Day 7th August at Dunsop Bridge. 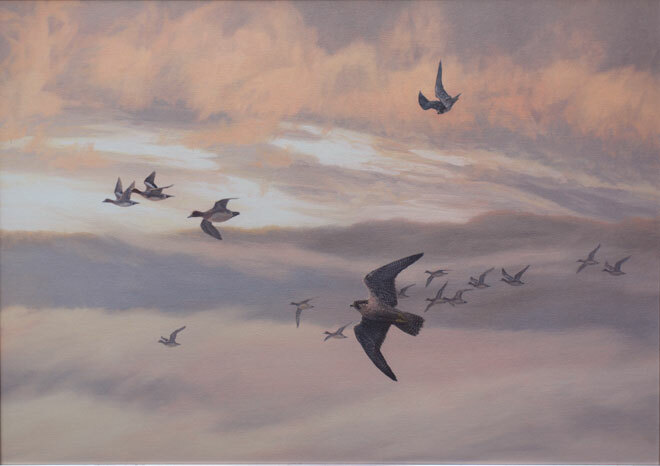 The framed colour print measuring 62cm x 44cm on canvas depicts a cast of Peregrine falcons flying in hot pursuit of wigeon and is aptly titled “Double Trouble”. Please enclose in your e-mail, your complete postal Address including postcode, contact home telephone number including a mobile number if you have one. The highest bid will be added on this page as they come in. All personal details will be treated in strict confidence. The name of the winning bidder will be posted online on Saturday 6th August. We have now received a new bid for £350.